The Goddess of Liberty was known in antiquity to the Greeks as Demeter. She was named “The Goddess of Liberty” for Her complete and wholehearted identification with the Divine Quality and Flame of Liberty – Her “God Consciousness” of Liberty. 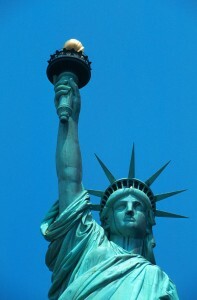 Her statue on Liberty Island (formerly Bedloe’s Island) in New York harbor portrays the figure of Longfellow’s “Lady with a Lamp,” whom he prophesied “shall stand in the great history of the land, a noble type of good, heroic womanhood.” She is the archetype of the “Woman clothed with the Sun” and the new age woman – inspiring the nations to Illumined Action by the Torch of Illumination and the Book of the Law. Temple of the Sun – While embodied on Atlantis, She erected the Temple of the Sun where Manhattan Island now is. With the sinking of Atlantis, the physical temple was destroyed, but the etheric counterpart remains on the etheric plane where she continues to focus the Flame of Liberty on the central altar surrounded by twelve shrines dedicated to the Twelve Hierarchies of the Sun.